An eagle is an incredible animal. I never knew until a conversation struck a few months ago over dinner. No animal is braver than an eagle. As the years go by, an eagle’s feathers become weighted down with oil and dirt, which hinders their ability to fly and hunt effectively. Their beak becomes encrusted with calcium which makes their beak less sharp and able. To soar and fly higher up the mountains, an eagle has to break it’s beak and tear out its feathers so that there is a renewal and growth. The craziest thing is that it is totally open to doing this incredibly painful process. It breaks it’s beak by knocking it against a rock and plucks it’s feathers out one by one. When everything grows back slowly, it is able to soar higher than before. How beautifully brave. But why am I educating you on the molting process of an eagle? Well, number one it’s amazing and number two – well it sheds light on our pain. It could be that you’re going through a break up with your boyfriend of 5 years. Whatever it is, wait for it. I believe that something has to die, for there to be renewal or growth. Something in your life dies, dissapears, is gone for good and then only can the new come. The eagle is plucking out his feathers and breaking his beak, throwing out the old in his life, and wanting to soar new heights, wanting to go even higher, even better. Although we don’t inflict pain on ourselves naturally, we do go through low moments in our lives and I’m here to say – seriously, don’t worry. Your pain sets you up for a brand, new you. If I hadn’t gone through that terrible heart break in high school, I wouldn’t have done any of this. No blog, no youtube channel, no make-up, nothing. I’d probably be working in a bank somewhere staring at the fog from 9 to 5. I wouldn’t have made that How to Get Over Someone video that some people even watch every night before they sleep to make them feel better. I probably wouldn’t have met the love of my life. Zilch. God had to pluck the feathers out for me and boy it hurt, but He set me up for the greatest journey ever. It was necessary. I’m happy I went through hard times because I understand that every single hard situation makes me a better and stronger person. I hope you feel the same too. But maybe it’s not about your heart. Maybe it’s about your dream. If you’re about to start on a journey, start with chapter 1. There is nothing wrong with sweeping the floor, getting on your knees and working long hours. Nothing. You want that dream? Do it! but never expect that you can just arrive at the destination. Just like an eagle, you’re going to have to “kill” your old self, and bring on the new you. That process might be painful – you might have to ask for uncomfortable (for your ego) requests, work longer hours, find a way. But all of that pain brings you to the destination. 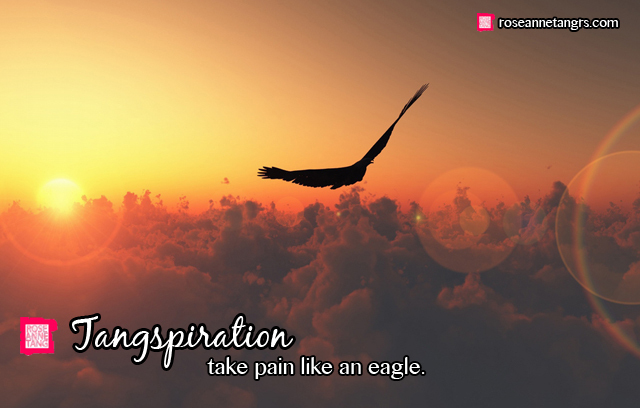 If you want it, you’re going to have to be like an eagle to soar greater and higher heights. DIY Nail Art Tutorial – Soft Pastel Roses! Review: NARS Sheer Matte Foundation! Trying Out the Best Spas in Bangkok, Thailand! You are doing a great work and I pray that The Lord will continue to prosper all that you do. Beautiful post Roseanne. 🙂 Definitely a wonderful piece that reminded me of how important it is to face pain bravely for renewal to happen in life. Cheers! glad you liked it love!